Hundreds of French immigrants arrive in largest summer aliyah event from second largest Diaspora community. More than 200 new immigrants from France arrived in Israel on Wednesday in a special flight organized by the Jewish Agency in conjunction with the Immigration Ministry and United Israel Appeal. A majority of the new immigrants are children or teens who will begin their first year of school in Israel at the end of summer vacation. The new arrivals were received at a welcoming ceremony at Ben Gurion Airport hosted by Jewish Agency chief Natan Sharansky, Immigration Minister Sofa Landver, and Keren HaYesod-United Israel Appeal chairman Mody Zandberg. Sharansky welcomed the new immigrants, saying "There is a huge future for French Jews in Israel. Each one of you made a huge step forward for your children's future and for building the future of the State of Israel." 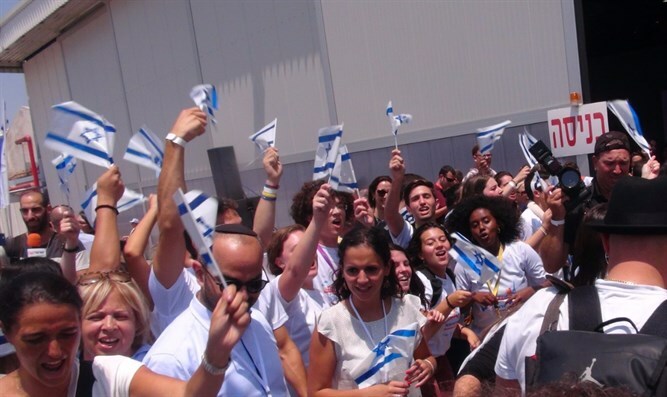 The Jewish Agency is set to bring more than 5,000 immigrants from around the world to Israel this summer. Wednesday's flight marks the largest-ever summer mass-aliyah from France. The majority of the new immigrants will settle in the coastal city of Netanya, with the remainder settling in Ranaana, Jerusalem, Tel Aviv, and Ashdod.